These were the most beautiful senior portraits I had ever seen. I couldn’t believe they were my girls. You never know how meeting someone by chance can put your life in a whole other direction. We would certainly have never guessed that when we met Laurie and her daughter Rachel by planning Rachel’s senior portraits through our senior portrait studio, My friend Teresa Studios that she would inspire us to go in a whole new direction. But let’s start at the beginning. Rachel was a rising senior at Cary Academy who had reached out to us about doing her high school senior portraits. Since Teresa became a professional photographer in 2010 she has focused almost exclusively on high school seniors, families, and small business branding images. My Friend Teresa Studios built a reputation in the industry for how she creatively captured the essence of each high school senior in a different way. Rock climbers sat atop sky high beams, backpackers waded across rushing rivers, fashionistas were ready for the cover of vogue, and bright lights and beautiful souls like Rachel were photographed at their best (sometimes even in the rain). Laurie was along for her daughter’s senior session, lingering as all moms do at the periphery of the session, allowing Teresa to work but happy to help however needed. Teresa remembers Laurie jumping in with a perfectly matching purple umbrella as the first drops of summer rain started to fall on Rachel’s session. It was a total fluke but if you’ve met Laurie and her family you come to see that things just seem to come together perfectly when they are around. Laurie loved Rachel’s senior portraits from My Friend Teresa Studios and both she and Rachel remarked on how comfortable we had made Rachel during her session and how impressed they were with the results. They selected a beautiful wall grouping for their home that showed off the different sides of Rachel’s personality. 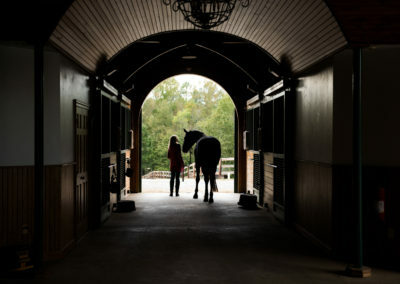 We can’t bear the thought that it would have all ended too soon if Laurie hadn’t mentioned that day that she’d love to have portraits with her horse, Curly. 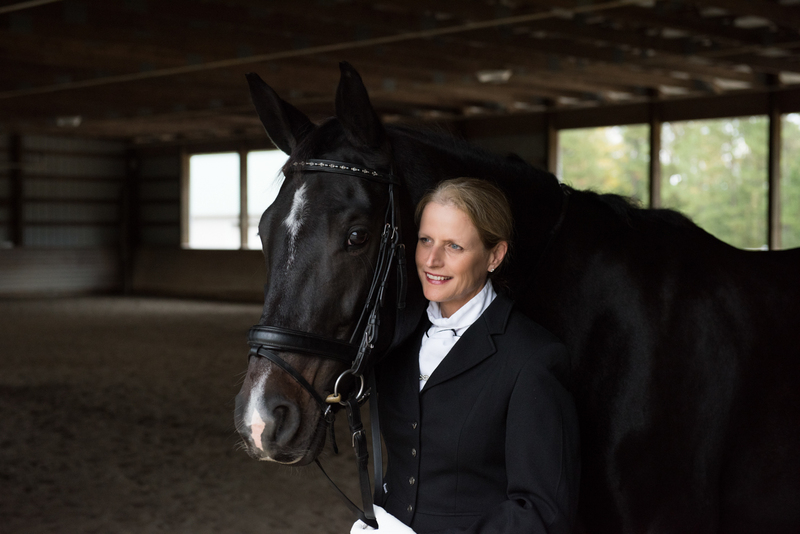 Teresa was excited and nervous to meet with Laurie a few months later at her barn in Apex. You see, feeling out a senior and how to make them comfortable, discovering who they are and showing it to the world, that had become a carefully honed skill that had become second nature. But a horse? A horse and a rider? 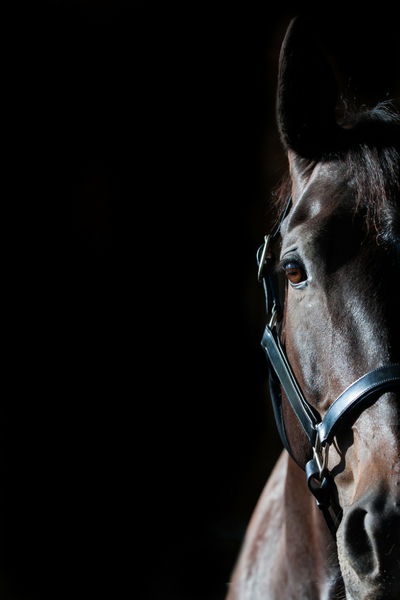 A horse wasn’t a prop like a cello or a basketball that could be moved and positioned and held just right. 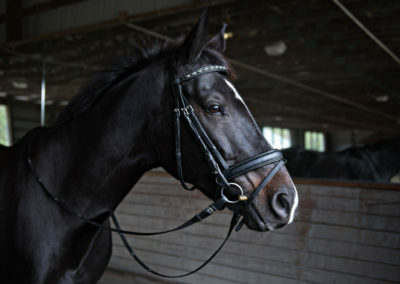 A horse was going to have its own feelings and opinions, its own way of standing comfortably, its own ‘best side’. 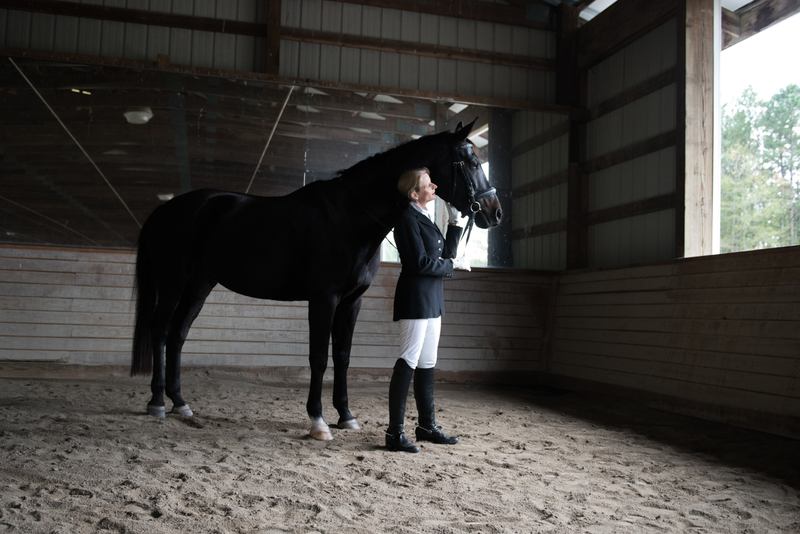 A horse wasn’t a prop, it was a very large person on four legs. Everything in our natural rhythm of photography was out the door. When we pulled in the driveway Teresa’s brain was jumping around like the gravel under her tires. The session started with anxious excitement from both Teresa and Laurie. Laurie was perfectly dressed for Fall with a pink textured top, jeans, and boots. Curly was beautiful too, clean and shiny from a day’s worth of beauty treatments. The barn has a beautiful back property with a long fence line near a gravel pathway, leading to a grove of trees bathed in light and exploding with fall colors. Leaning against the fence, their gentle relationship was easy to see, with the sweet way Laurie ran her hand along Curly’s side. The crisp October air blew around the smell of Fall. 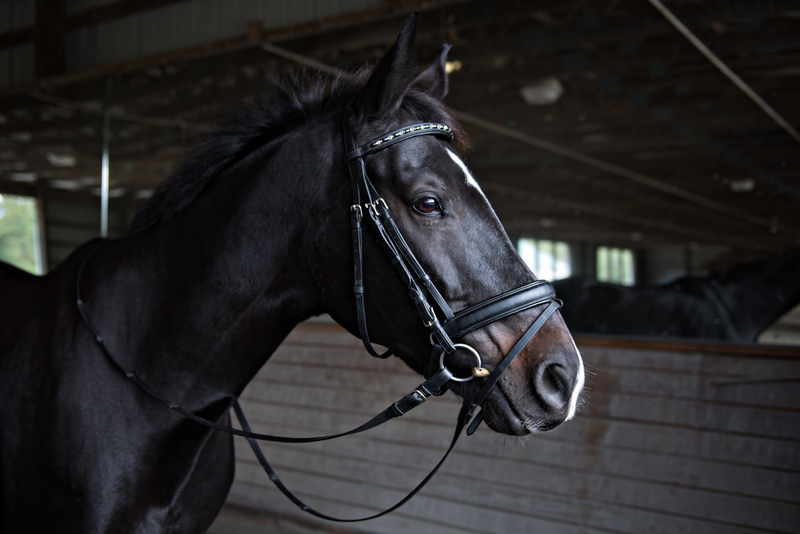 We’ve never had to care about ear placement before but we quickly learned that happy horse ears make beautiful portraits. 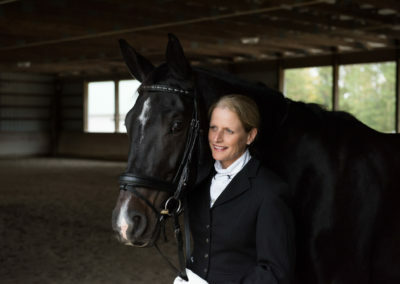 Within a few minutes Laurie was relaxed and surprised how much she was enjoying the equine photography session. She remarked to Teresa how glad she was that they had met at Rachel’s senior portraits, and Teresa had to agree. This was an awesome new adventure. 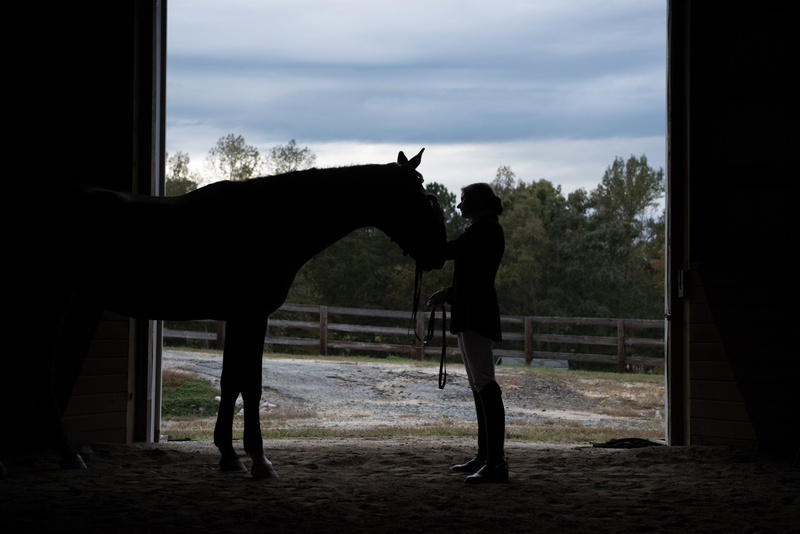 The barn itself, with a gorgeous pitched ceiling and chandelier provided the perfect lighting for silhouette portraits. Even without seeing the expression on their faces you can see the close bond between Curly and Laurie. 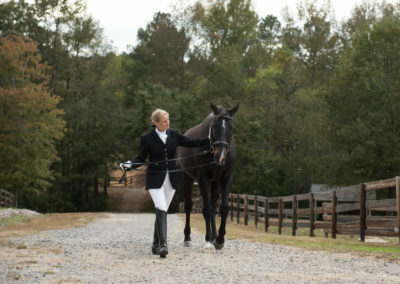 As the sun sunk lower in the sky, Laurie went inside to change in to her dressage attire. 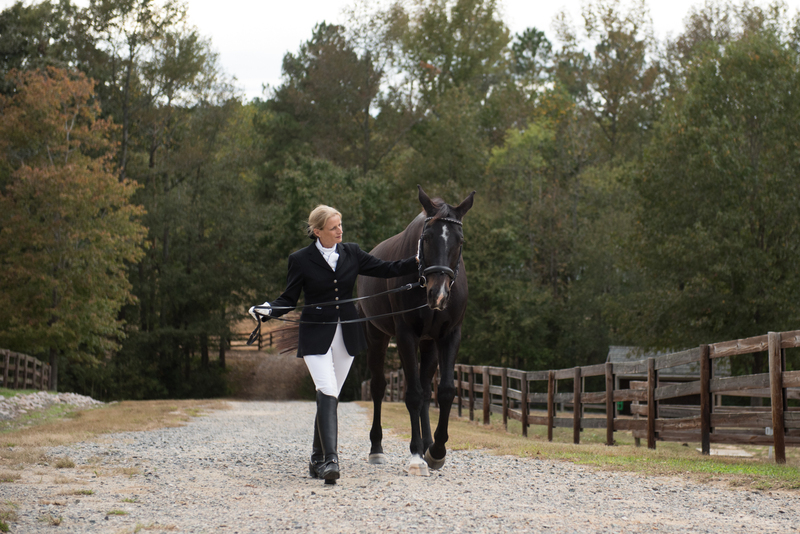 As a dressage equestrian Laurie has put a lot of hours in to training with Curly. The most finite movements are tweaked and perfected. The turn of Curly’s head, the perfect posture of them both, and the quiet responsiveness of one to the other brings them both satisfaction in the arena. It elevated our work as well. 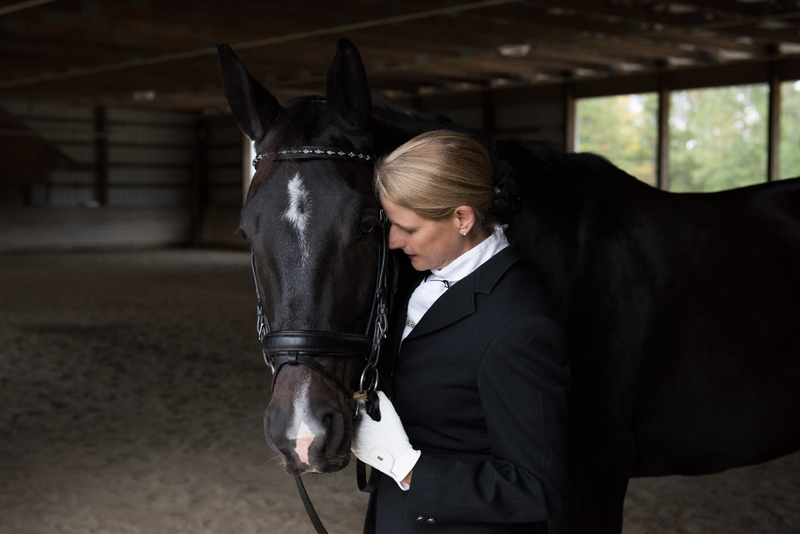 Seeing Laurie make her transformation from horse-lover around the barn to dressage equestrian brought a hyper focus to our last bit of time together. Their precision brought out our precision. Their quiet perfection, made us strive for the same. 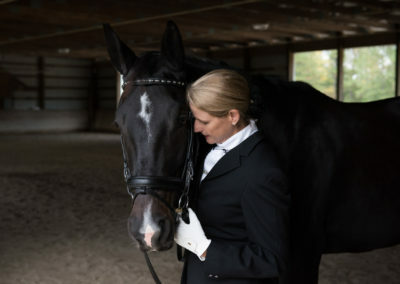 Laurie had seen and purchased her fair share of competition pictures but in that arena I wanted to give her exquisite portraits of their relationship. With a fine layer of arena dirt in our shoes, and lungs full of fresh air, we left feeling giddy. New love giddy. Where you can’t quite explain what just happened but you know it is essential, where you can’t eat, and you can’t shut up, and you can’t wait to sit alone and just bask in the warmth of falling in love with something new. 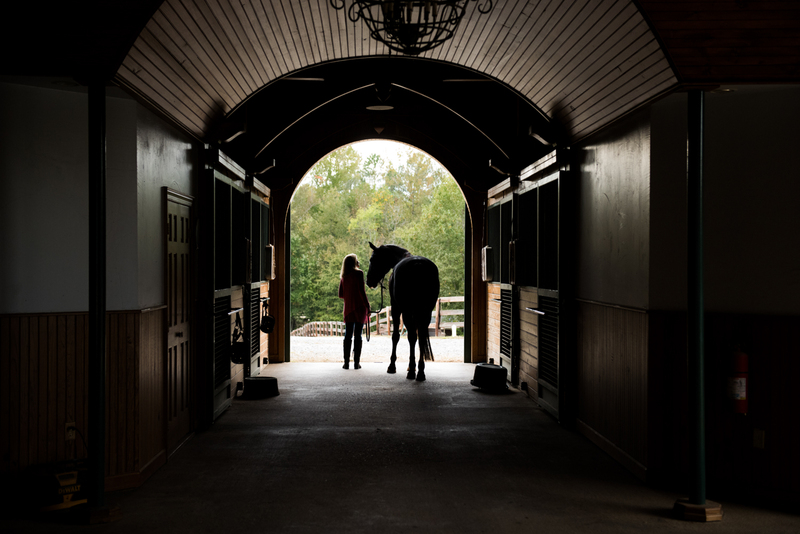 We didn’t know where this journey would lead us but on that day, in that barn, Porter Fine Art Equine Photography was born. You just never know when someone comes in to your life, how they will change it forever and now there are hoof prints on our hearts. Join our mailing list to hear about special promotions, see news from the Studio, and be the first to know about model calls.